Loro Piana "Davis" chambray pants. Ankle-length with ankle side zip. EXCLUSIVELY AT NEIMAN MARCUS AG "Farrah" pants in 7.8 oz. super-stretch sateen. Approx. measurements: 9.75" rise; 30" inseam; 39" outseam. 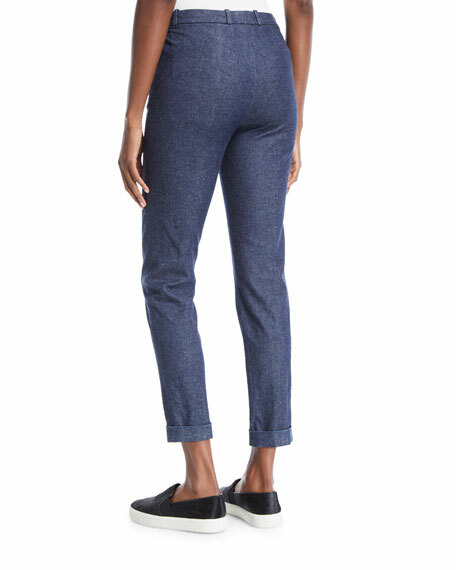 Joan Vass soft interlock pants with stretch for ease of movement. Approx. measurements: 11" rise; 21" inseam; 20.5" leg opening. 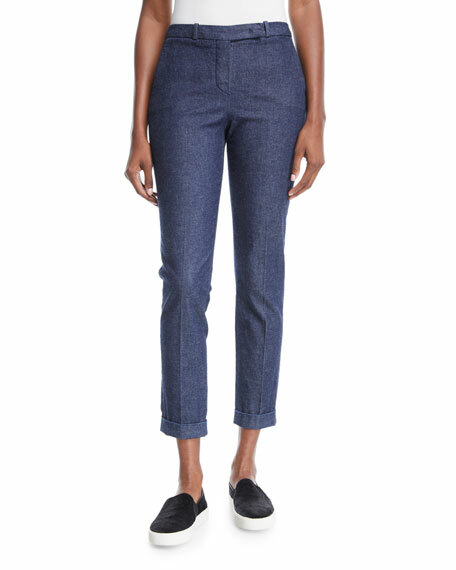 Joan Vass soft interlock pants with stretch for ease of movement. Approx. measurements: 11" rise; 21" inseam; 20.5" leg opening. Pull-on style. Wide legs. Cropped at ankle. Cotton/spandex. Machine wash. Imported. 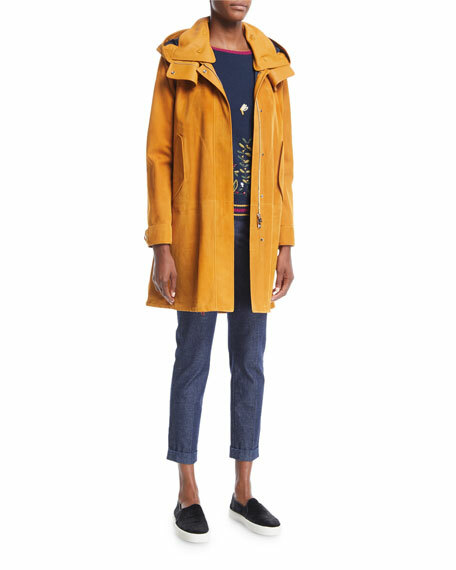 Model's measurements: Height 5'11"/180cm, bust 32"/81cm, waist 24"/61cm, hips 34"/86cm, dress size US 2/4. Joan Vass pants with plaid front and solid back. Approx. 26" inseam. Mid-rise; smooth waistband. Slim legs; cropped above ankle. Joan Vass pants with plaid front and solid back. Approx. 26" inseam. Mid-rise; smooth waistband. Slim legs; cropped above ankle. Pull-on style. Front, polyester/rayon spandex. Waistband back, rayon/nylon/spandex. Hand wash or dry clean. Imported. Model's measurements: Height 5'10"/177cm, bust 33"/84cm, waist 25.6"/65.2cm, hips 35.8"/91cm, dress size US 2-4/FR 34-36.